Has anyone heard of this Cambodian snake-catching technique or similar ? Early yesterday morning, rescuers in Samut Prakarn responded to a call from the security guards of Thai Central Chemical Company, who found a python hidden in the engine of the company’s pickup truck. 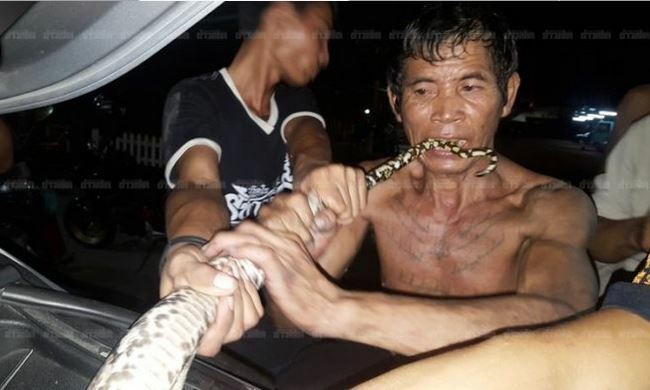 But the snake kept crawling away from the rescuers and wrapped itself tightly around the car’s undercarriage, so a [Cambodian] migrant worker employed by the company, identified only as “Rathit,” stepped in to help. He said it was an ancient Cambodian method to bite on the serpent’s tail several times so it would let go. While we absolutely cannot vouch for its Cambodian origins, the tail-biting technique worked in the end, as the snake gave up, and Rathit pulled it out from under the car. I bet the tattoos on his chest helped give him the magic powers he needed.